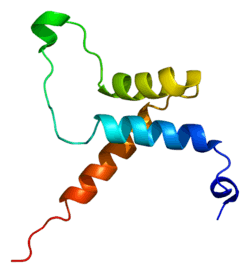 This gene product is a member of the transcriptional enhancer factor (TEF) family of transcription factors, which contain the TEA/ATTS DNA-binding domain. Members of the family in mammals are TEAD1, TEAD2, TEAD3, TEAD4. TEAD3 is predominantly expressed in the placenta and is involved in the transactivation of the chorionic somatomammotropin-B gene enhancer. It is expressed in nervous system and muscle in fish embryos. 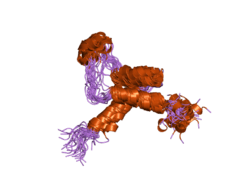 Translation of this protein is initiated at a non-AUG (AUA) start codon. ↑ Jacquemin P, Depetris D, Mattei MG, Martial JA, Davidson I (Jan 1999). "Localization of human transcription factor TEF-4 and TEF-5 (TEAD2, TEAD3) genes to chromosomes 19q13.3 and 6p21.2 using fluorescence in situ hybridization and radiation hybrid analysis". Genomics. 55 (1): 127–9. doi:10.1006/geno.1998.5628. PMID 9889009. ↑ Jacquemin P, Martial JA, Davidson I (May 1997). "Human TEF-5 is preferentially expressed in placenta and binds to multiple functional elements of the human chorionic somatomammotropin-B gene enhancer". The Journal of Biological Chemistry. 272 (20): 12928–37. doi:10.1074/jbc.272.20.12928. PMID 9148898. 1 2 "Entrez Gene: TEAD3 TEA domain family member 3". ↑ Bürglin, TR (Jul 1991). "The TEA domain: a novel, highly conserved DNA-binding motif". Cell. 66 (1): 11–12. doi:10.1016/0092-8674(91)90132-I. PMID 2070413. ↑ Mann CJ, Osborn DP, Hughes SM (Oct 2007). "Vestigial-like-2b (VITO-1b) and Tead-3a (Tef-5a) expression in zebrafish skeletal muscle, brain and notochord". Gene Expression Patterns. 7 (8): 827–36. doi:10.1016/j.modgep.2007.08.001. PMC 3360971 . PMID 17916448. Jiang SW, Wu K, Eberhardt NL (Jun 1999). "Human placental TEF-5 transactivates the human chorionic somatomammotropin gene enhancer". Molecular Endocrinology. 13 (6): 879–89. doi:10.1210/me.13.6.879. PMID 10379887. Vaudin P, Delanoue R, Davidson I, Silber J, Zider A (Nov 1999). "TONDU (TDU), a novel human protein related to the product of vestigial (vg) gene of Drosophila melanogaster interacts with vertebrate TEF factors and substitutes for Vg function in wing formation". Development. 126 (21): 4807–16. PMID 10518497. Maeda T, Mazzulli JR, Farrance IK, Stewart AF (Jul 2002). "Mouse DTEF-1 (ETFR-1, TEF-5) is a transcriptional activator in alpha 1-adrenergic agonist-stimulated cardiac myocytes". The Journal of Biological Chemistry. 277 (27): 24346–52. doi:10.1074/jbc.M201171200. PMID 11986313. Peng L, Huang Y, Jin F, Jiang SW, Payne AH (Aug 2004). "Transcription enhancer factor-5 and a GATA-like protein determine placental-specific expression of the Type I human 3beta-hydroxysteroid dehydrogenase gene, HSD3B1". Molecular Endocrinology. 18 (8): 2049–60. doi:10.1210/me.2004-0028. PMC 3273420 . PMID 15131259.